The custom domain quota represents the number of SSL hosts. A quota of one custom domain corresponds to one SSL host. The SSL host holds the mapping between your chosen custom domain and the application on SAP Cloud Platform as well as the SSL configuration for secure communication through this custom domain. Generate a certificate signing request (CSR), and use it to get a server certificate signed by a certificate authority (CA). 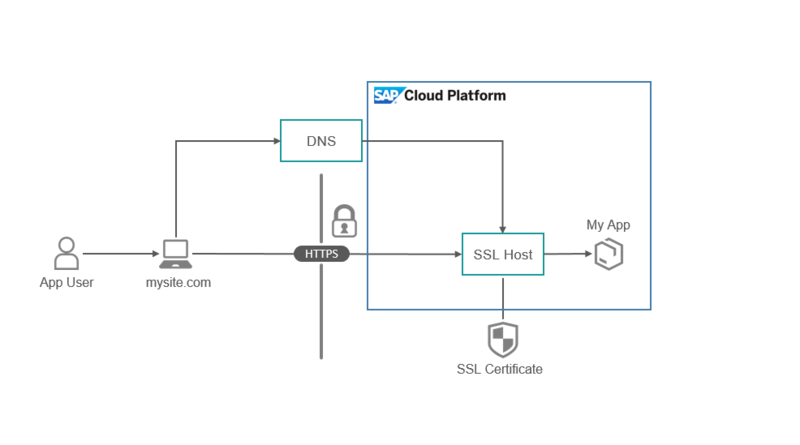 Then, upload the signed certificate to SAP Cloud Platform, and bind it to the SSL host. Make your application on SAP Cloud Platform accessible via the custom domain by mapping the custom domain to the application URL. Route the custom domain traffic to your application on SAP Cloud Platform by configuring it in the Domain Name System (DNS) that you use. The SAP Cloud Platform, Custom Domain service lets you configure your own custom domain to expose publicly your SAP Cloud Platform application instead of using the default hana.ondemand.com subdomain.